In this tutorial, you will learn what WordPress security keys are and how they are used to keep your WordPress site secure. This tutorial is part of our tutorial series on WordPress Security. In this tutorial, you will learn what WordPress security keys are and how they are used to keep your WordPress site secure. When users log into WordPress, their login session information is stored in their web browser by way of web browser cookies (as opposed to being stored in the website’s server). As storing any kind of information in a web browser represents a potential security risk, WordPress needs to use a secure method to manage login sessions. Typically, most login usernames and passwords tend to be simple strings of characters, and so, if all the browser cookies did was to store these login details without any added security layers, a username/password combination would be easily broken. To make the information stored in browser cookies harder to crack, WordPress uses ‘Security Keys’ (also referred to as ‘Secret Keys’) to add more complex layers of security to your site. WordPress Security Keys are a set of random strings of text and numbers that improve the security of your WordPress site by improving the way information is encrypted and stored in users’ cookies. 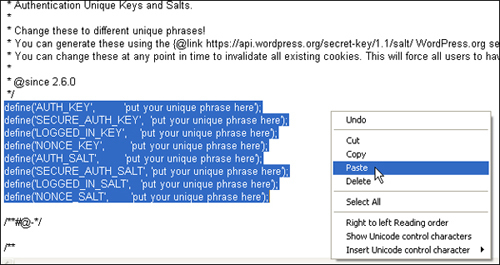 The long random strings used to calculate the cookie hash in the screenshot above are the WordPress Security Keys. These keys are configured in your wp-config.php files. Note that the above also refers to something called ‘salts’. A salt is random data that is used as an additional input to a one-way function that hashes a password or passphrase. 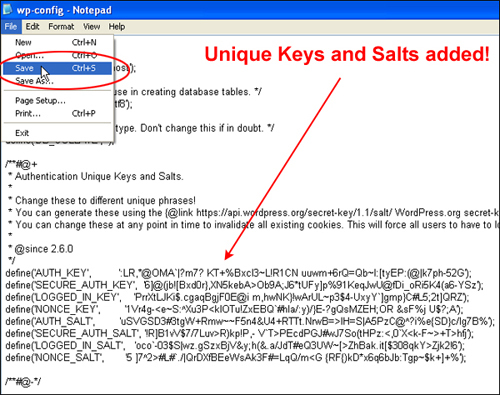 The primary function of salts is to defend against dictionary attacks and pre-computed rainbow table attacks. Cryptographic salts are broadly used in many modern computer systems, from Unix system credentials to Internet security. ‘Salts’ are important because they make WordPress ‘Security Keys’ even harder to crack. If these salts are compromised, the security behind WordPress authentication is significantly weakened. In fact, according to a WordPress code expert, it’s 200,000,000,000,000,000,000,000,000,000,000 times easier to hack into the WordPress authentication cookie if you know the keys. Using ‘Secret Keys’ and ‘Salts’, therefore, significantly increases the security of your WordPress sites. Adding WordPress security keys is a very simple and easy process. Note: You will need to have access to your wp-config.php file (located in your WordPress installation folder where all of your other WordPress folders and files are stored) and know how to use FTP. All you have to do to create WordPress security keys is to make them long, random and complicated. 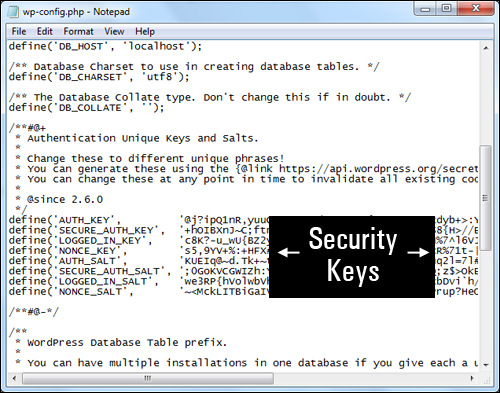 Once you have generated your security keys, copy everything and save it to a plain text file. You will need these in just a moment. The next step is to add them to your wp-config.php file. Editing the wp-config file incorrectly can destroy your WordPress site permanently! Make a back up of your wp-config.php file before editing the file. This way, if something goes wrong with the edited file, you can replace it with the original copy of the file and recover your site. Save your wp-config.php file and reupload it to your server, overwriting the old wp-config.php file. Typically, you would also add the security keys to your wp-config.php file when installing or re-installing WordPress manually. You will need to insert the Secret Keys and Salts into this file. If you already have your keys, then use these – you should have copied them to a text file. 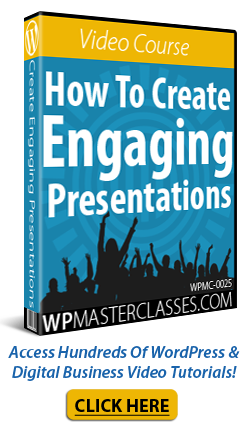 Save your wp-config.php file, and you are done. For the sake of keeping your WordPress site secure, it’s recommended that you change the security keys on your site every so often. You don’t need to remember or store the security keys. 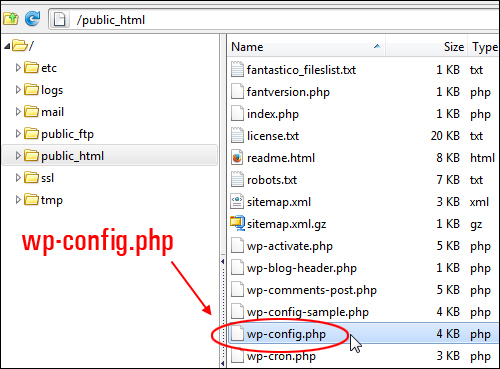 Once you have added this information to the wp-config.php file you are done. If you are logged into your WordPress admin panel when performing the security key operations described above, then you will be asked to log back into your site again. You can change security keys at any point in time to invalidate all existing cookies. If you do this, all users will need to login again.